60th birthday wishes mark a major milestone — turning 60. 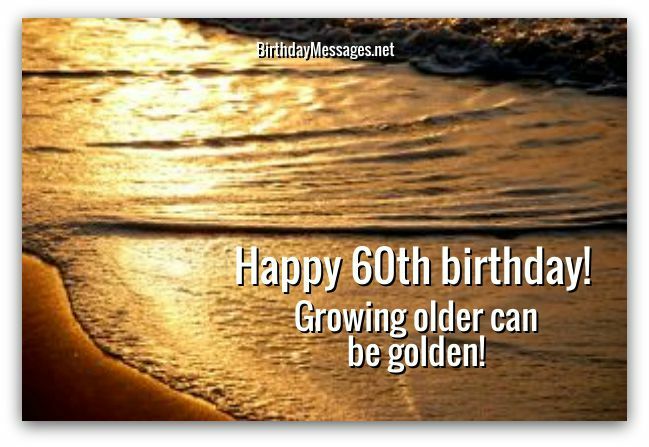 You should really honor this occasion with birthday messages that celebrate everything wonderful about 60 year olds — like the ones on this page do. When my brother turned 60, he told me at the time that, for the first time in his life, he felt "old" — both physically and mentally. How do you deal with any loved one who feels this way...with a simple birthday greeting. You don't. You give them 60th birthday messages that are anything but simple. This requires serious humor and/or inspiration. The choice, of course, is up to you, based on what you think is the best route for the birthday girl or boy. 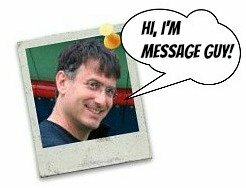 If you need any assistance during your search, feel free to read Message Guy Tip #41, which is packed with many helpful hints for choosing the perfect birthday greeting. Wishing you all — and only — the best on your 60th birthday. Happy birthday! May your special day be 24 wonderful hours of joy, laughter and great memories! Happy birthday! Yes, your 60th birthday is the start of something magical: senior discounts on everything. Happy birthday to the youngest 60 year old I know. And it's not just because you look young. It's also because you define what youth really is — a bright, beautiful, sunshiny day. Like today! The world is a better place since you entered it 60 years ago, so mark your birthday with a special day that celebrates YOU. Happy 60th birthday! Finally, you have the time and money to do all the things you've dreamed of doing for the last 60 years. Now all you need is the energy to do it! Wishing you a sensational 60th birthday as sensational as you are! Happy birthday! 60 suits you like a dream — it looks just perfect on you! Happy 60th birthday! Every passing year brings new experiences and renewed hope for tomorrow. May you have both on your special day...and every day. 60 is not 60 anymore. It’s anything you want it to be. The only difference between 60 or 50 or 40 is your level of experience. Happy 60th birthday! You must feel amazing with 60 years of making the world a much more amazing place. Happy 60th birthday! Happy 60th birthday! The number of candles on your birthday cake isn't the only fire hazard around here, hot stuff! Happy birthday! Every year of age has a story to tell. At 60, you must have a magnum opus. Happy birthday! 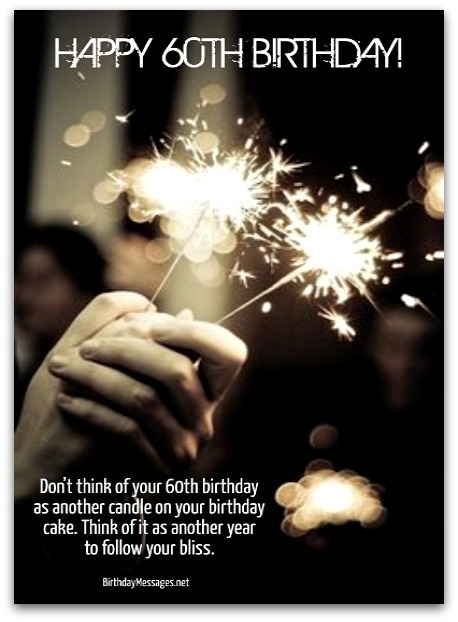 Don’t think of your 60th birthday as another candle on your birthday cake. Think of it as another year to follow your bliss. Happy 60th birthday! Congratulations, now you have the best of both worlds: the time to do what you want and the senior discounts to pull it off. Happy 60th birthday! You don’t look a day over 50... A day over 59 is more like it. The older you get, the more precious you become. Today, you are the most precious of all treasures. Happy 60th birthday! Happy birthday! Congratulations on hitting 30 for the second time (this time, though, it may hurt). exclusive birthday videos to birthday discounts! Be the first to see what's new! belong to the individual authors.